Hebron Way is the vein, off Torbay Road, around which is built a less dynamic collection of stores and offices than the thriving throng, just southeast, around Stavanger Drive. Although, when that magnet of commerce, Costco, takes its leave for Galway I suspect things will calm down considerably on and around Stavanger as well. Wing’n it on Hebron Way, is one of three such eateries in St. John’s. I chose the Hebron location because its in a relatively new building – just a few years old – and assumed, since it would have been a blank canvas, that this restaurant best represented whatever vision the owners had for the chain. A soundtrack of country music signalled that we were in laid back, family restaurant territory. Who could possibly feel uptight listening to Vince Gill? Two large wings, err sorry, I meant rooms, make up the bulk of the restaurant, except for a private space off the room that houses the bar. We were seated in the bar room. Apart from a long drinks bar, supported by a base of light stone brick, the room contains an arrangement of booths and high tables. A feeling of spaciousness is unavoidable, mainly because skyward, beyond the tops of the walls, you’re staring into a deep, dark void. Despite the aviation theme, I saw no model Twin Otters, or even a kite suspended above. A black and white mural featuring planes and gauges rose above our heads, attached to a top section of wall. It goes high enough to flirt with the edge of the black void. Wing’n it’s fixtures and furniture are attractive enough but decorative elements seem to have been pulled together on a wing and a prayer. Perhaps I should say, a chicken wing and a prayer. Haphazard unframed photos of vintage planes and other aviation collectables adorn the walls to no great effect. 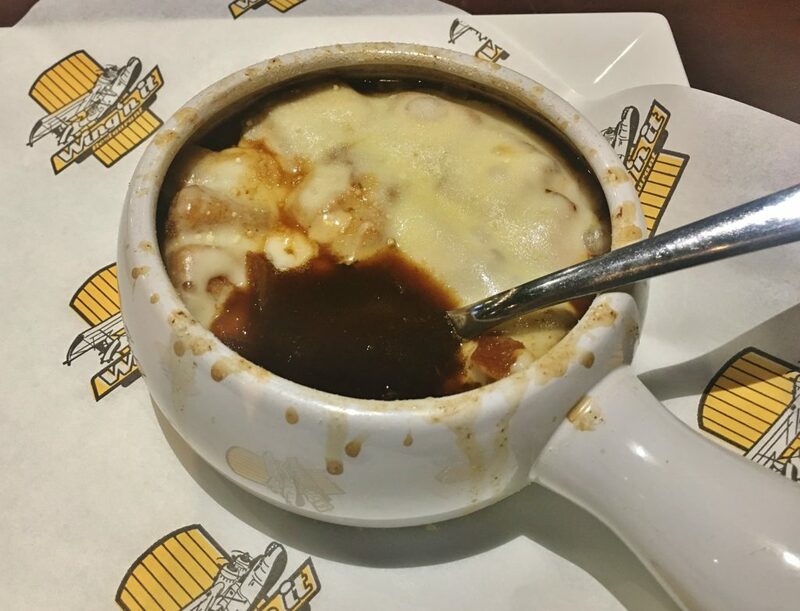 A hot bowl of French onion soup, on a bone chilling day, seemed right. The dark liquid was spot on in taste and texture. It was oniony, beefy, intense. Unfortunately, the topping, the part that really makes it “French” onion soup, was pathetic. A half-hearted attempt was made to cover the soup with soft, soggy, sliced bread, underneath a glossy, insipid processed cheese slice – think Kraft Singles. 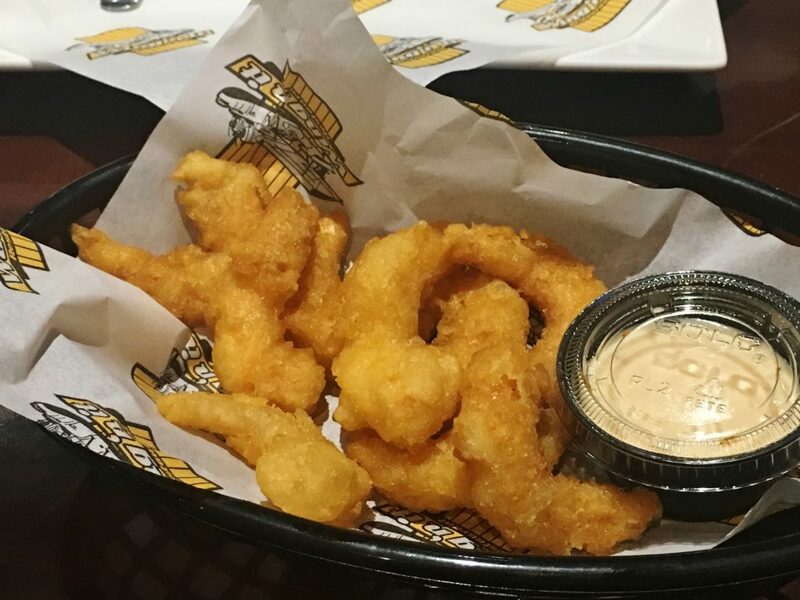 A basket of 10 battered, deep fried shrimp arrived with a dipping mayonnaise. Shrimp flavour was trumped by the taste of the flour batter coating. Way too much batter. If the tiny shellfish had been dressed in an actual coat – sized comparably with the batter – it would have been several sizes too big. Like Danny DeVito wearing Arnold Schwarzenegger’s topcoat. The batter had loads of crisp and crunch, a big, showy opening let down by its star, one, small, feeble shrimp with a faint, practically inaudible warble. 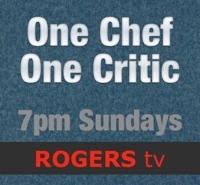 I was reminded of the frozen, battered, crispy shrimp flogged by that handsome, grey bearded sea salt who wears the captain’s hat and blue seaman’s jacket. 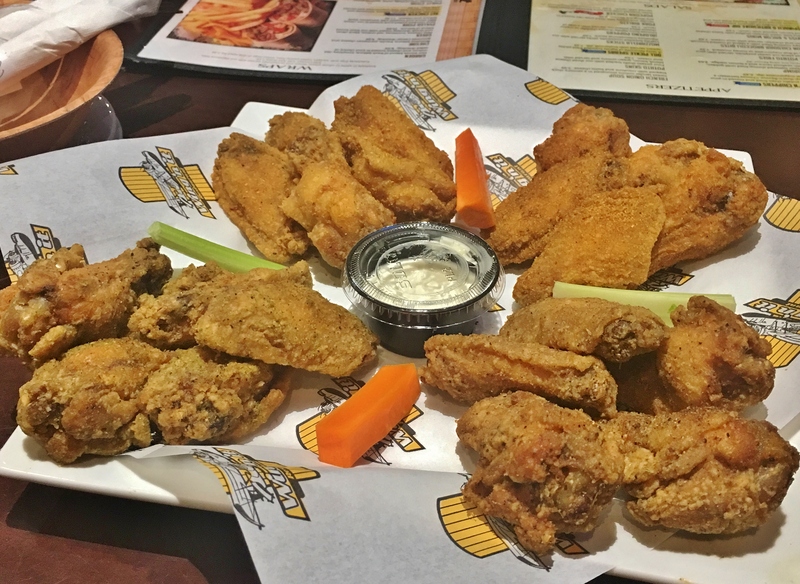 Next came a platter of dry rub wings, in four flavours, with a ranch dip. I’ve had wings that were bigger, juicier and more tender. I’ve also had wings that were much worse, meaning overcooked, bony and dry. But, I was surprised that a restaurant called Wing’n it did not have the best wings in town. Of the four flavours – roasted red pepper, Cajun, jerk and garlic – I much preferred the roasted red pepper. They were tangy and fulsomely flavoured with paprika. The garlic wings were excellent as well, but the Cajun wings required ranch dressing to make them even moderately interesting. 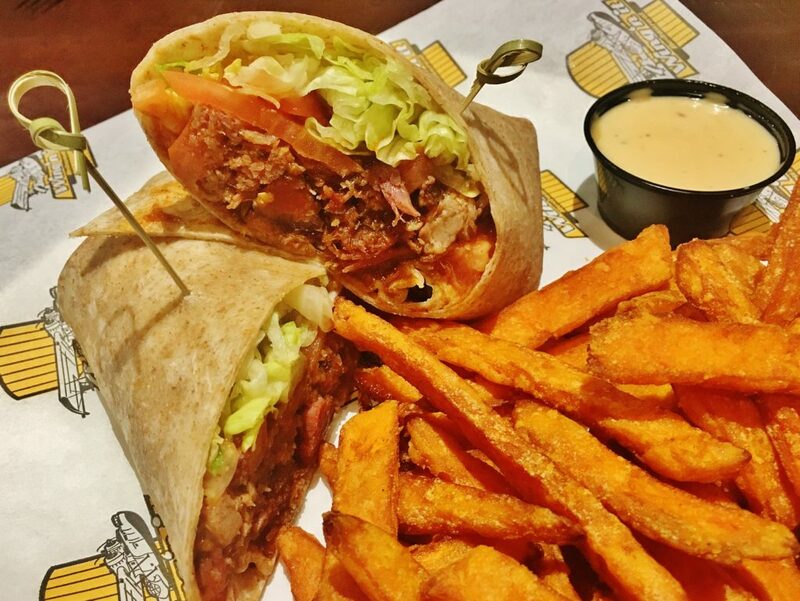 The most satisfying menu item, by far, was Wing’n it’s pulled pork wrap. I liked the soft, thin wrapping because it didn’t get in the way of a very substantial filling of rich, tender pulled pork, flavoured by BBQ sauce – the smoky, tangy, and a little too sweet kind. Lame fillers were absent, save just a few shreds of lettuce and tomato. Sweet potato fries, on the side, were exactly right. I had a thundercrunch chicken sandwich. Thundercrunch, I suppose, is meant to convey that something is over-the-top crunchy. So crunchy that it makes a sound like rumbling thunder inside your head. In this case, it did, but not for long. To be honest, it was more like a few quick claps. The piece of chicken breast seemed to get lost, amongst a bunch of other things, between the two halves of Kaiser roll. 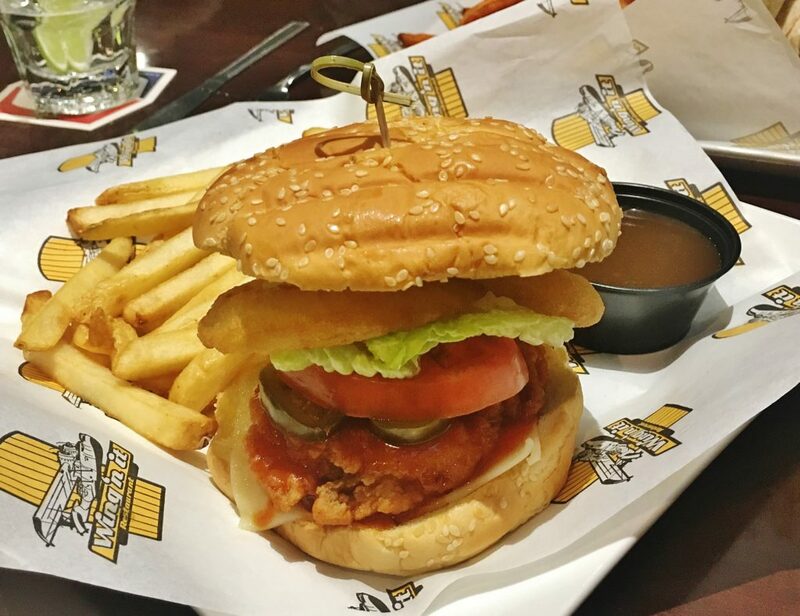 There was a deep-fried onion ring – crisp but not crunchy – tomato, crisp lettuce, crisp pickle and cheese. I would have been much happier with more of the thunder and less of the crisp. Wing’n it isn’t flying as high as it could be, in terms of my star rating. Some tweaking of certain menu items would make a great difference. Service, however, is superb. Price Dinner for two with soft drinks, tax and 18 percent tip costs approximately $75. Service Excellent in every way. Open Monday to Thursday from 11 a.m. to 11 p.m., Friday and Saturday from 11 a.m. to 12 a.m., Sunday from 12 p.m. to 11 p.m. Beverages Jackson Triggs house wines, a handful of modestly priced Australian wines, cocktails, beers, soft drinks, juices, water, milk, tea and coffee. Best bets Pulled pork wrap and roasted red pepper wings. Wheelchair access Some assistance may be required at entrance. Restrooms are accessible. I recommend calling ahead to check on table access.